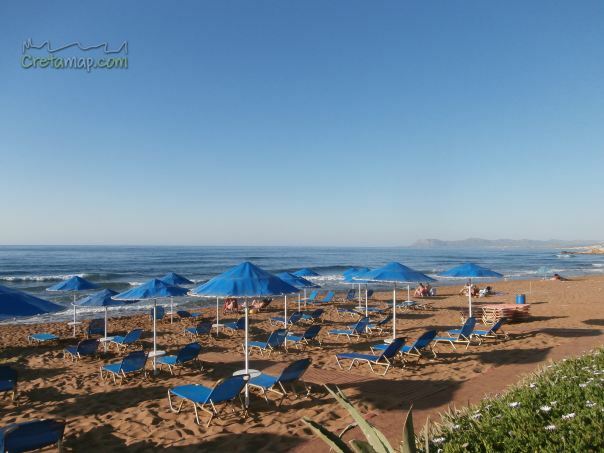 The long and sandy beach of Stalos is 7km west of Chania town, extending for about 2km to its neighbouring Agia Marina beach. Umbrellas and sunbeds, showers, lifeguard, parking, cafés, snack, beach bars, restaurants, water sports, accommodation, All Inclusive Hotels, pharmacies, doctors, ATM cashpoint machines, super markets, shops, Car rentals. Legend has it that its name derives from Talos, a bronze giant that circled the island everyday to guard it from the enemies. From the beach you can see the Thodorou islet, a preservation area of the Cretan wild goat. *Due to its length, the beach never gets overcrowded. **Like all beaches on the north west coast of Crete, it is affected by the winds which blow during July and August and are widely known as “meltemia”. Stalos beach is easily accessible from Chania town by frequent public buses from Chania or by rented cars and motorbikes.